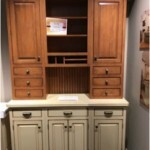 These beautiful custom made kitchens are on display in our showroom and available for immediate pick up. 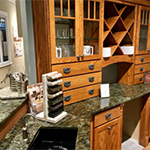 You are free to examine them in our showroom M-F 10-5 or by appointment. 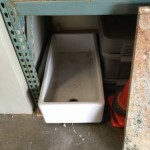 This sink is a very traditional, heavy duty premium sink that lists for $2403.00. It can be installed as an under-mount, or an apron front sink. The drain is off-set, and the sink can be flipped to be installed on the left or right side. This sink was never connected to water and is in excellent condition. 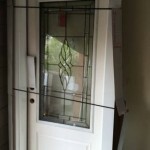 It is extremely durable and weighs 165 lbs. 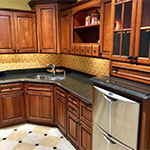 The minimum cabinet width recommended is 39″. This sink is a great deal at $900 as is.